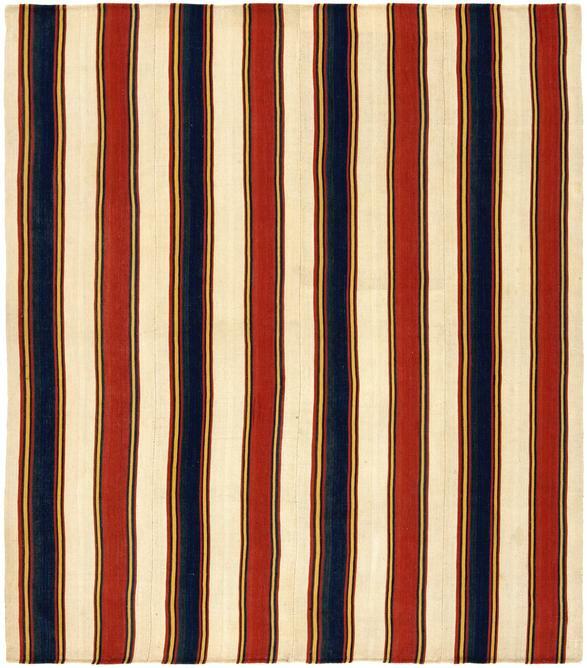 5' 10" x 6' 8"
A richly articulated pattern of vertical stripes unfolds across the field of this dazzling Qashqai Pelas. The arrangement is based in the alternation of red and blue bands with intervening bands of ivory. Narrow stripes in yellow, black, and red reinforce the larger bands. The constancy of the ivory sections gives them a certain visual unity, such that they appear to be a single ivory ground behind the pattern of bands. The joins between the separately woven sections are articulated in a bold tubular relief, nicely accenting the structure rather than concealing it.